Differentiate Learning Addition with a Google Sheet! Prior to Google Educator Training I had a fear about using Google Sheets in that matter even a Microsoft Excel Spreadsheet. This fear is fading away since learning there is so much more one can do with a Sheet than I ever imagined. What I’m going to share is a support to help the elementary student with becoming independent as they learn how to add up to 1,000. 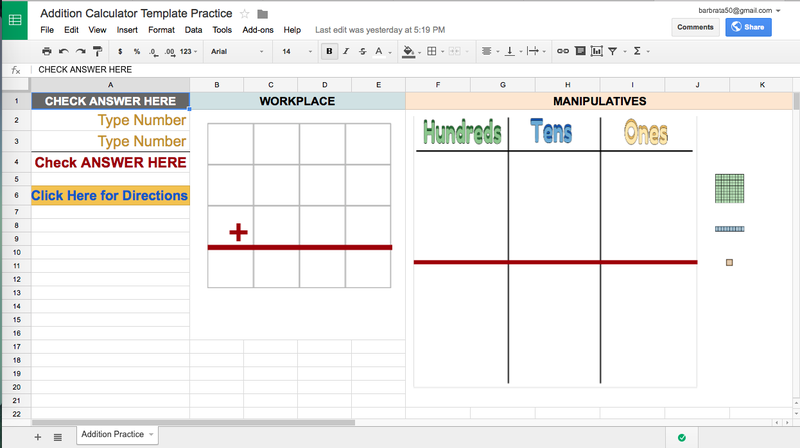 Below is a screenshot of the Addition Practice Google Sheet Interactive. WHY USE A SUPPORT LIKE THIS? Watch for a followup post on how this Interactive Math Manipulative was created. You could build interactives like this using Google Sheets for subtraction, multiplication, division and ? Please share what ideas you come up with in the comment section. I’m looking forward to hearing how you have incorporated the Google APPS for Education suite in the classroom.